Rancho Espirito South is located in the diverse Post Oak Savannah region of Texas, with huge post oak trees dominating the forest but also include live oaks, water oaks, juniper, elm and various other trees. About 85% of the ranch is in thick timbers and heavy underbrush making for excellent wildlife habitat. 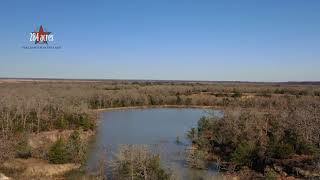 The ranch has excellent topography with over 100 of elevation changes. The ranch has unique features such as deep canyons that have been carved out of the hillsides making extremely interesting terrain. (the ranch is under Wildlife 1D1 exemption).